Added on February 4, 2015 by J.D. Magers. 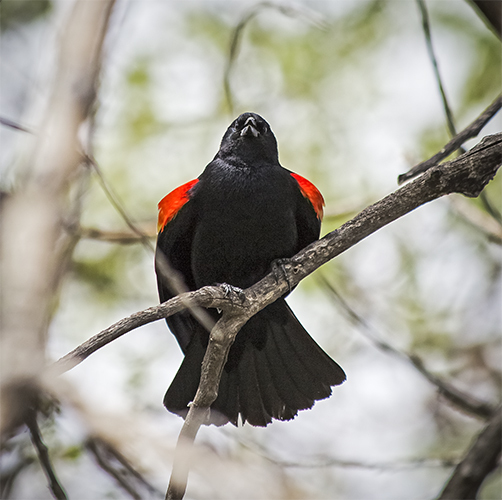 Red Winged Blackbirds are so cool. I attract them every day to my bird feeders in the backyard. Not surprising really, given they're everywhere. But there is just something about that red spot on each shoulder that draws me to them. Especially when the golden hour light hits them just right, and you can see how vibrant it can be. This image isn't at golden hour, but it was at Barr Lake mid morning on a flat light day. Goes to show you what can be accomplished even under "crappy" lighting conditions. The bird saw me taking his picture, and wasn't afraid to tell me hits thoughts on the matter. I really like how you can see both of his eyes, and there is also a lot of detail in the feathers on his breast and tail. Red Winged Blackbird, Barr Lake State Park, Adams County Colorado.